Explore Australias rugged Kimberley region from Broome to Kununurra by private 4 wheel drive vehicle. This 13 day, 11 night camping and 1 night lodge adventure through the heart of the West includes a whole host of activities. Explore the underground caves at Tunnel Creek, the tranquil pools at Bell Gorge and the lily-filled waters at Galvans Gorge. Trek through sandstone ranges at El Questro, spot wildlife in Geikie Gorge and hear stories from a descendant of the traditional owners of the Sunday Islands. Visit pearl farms at Cygnet Bay, admire the iconic Bungle Bungles and camp by a billabong (Banjo Patterson-style) on a cattle station. Get as active as you want or simply enjoy the serenity of this unusual corner of Australia. Cape Leveque is one of Australias most beautiful, spiritual and remote places. Not many people visit this part of the world, but you will. This trip is a bit more comfortable than a rustic camping experience, as there are a few more added home comforts, even if you do need to bring a sleeping bag! The weather conditions can be challenging in the Kimberley, please ensure you are aware of the heat encountered in this region. Expect some early morning starts! It is nicer to walk in the cooler morning and travel in the vehicle during the heat of the day. If camping isn’t for you but you love this itinerary, contact our Australia experts on 01928 246 243 who can tailor make your bespoke Australian itinerary. The Dampier Peninsula is an extraordinary blend of stunning coastline and indigenous culture. Travelling up the red 4WD track, learn about the region’s fascinating history by guided commentary. Your first stop is for morning tea at the Beagle Bay Aboriginal Community, home of the Beagle Bay Church and its glimmering pearl shell altar. By mid-morning, arrive at One Arm Point (also known as Ardyaloon) home of the Bardi-Jawi people, an Indigenous community perched on the tip of the Dampier Peninsula, and visit the Communitys aquaculture hatchery for barramundi, pearl and trochus shell. You wil also visit Kevin and Donna, traditional owners from One Arm Point who will tell us about their history and life on the peninsula as they make us a traditional sand cooked damper to enjoy with a picnic lunch. After lunch, arrive at Cygnet Bay Pearl Farm to enjoy a pearl appreciation tour and then embark on an extraordinary cruise through the Islands of the Giant Tides. In the evening, you’ll reach the remote private safari camp, exclusive to our travellers and nestled on the beach overlooking the bay. In this stunning location, you can swim, explore the mangroves or go for a walk in the dunes to find some old pearlers graves: truly a privileged experience. Includes lunch and dinner. Travel back to Cygnet Bay Pearl Farm by boat to undertake a tour of Australias oldest pearl farm. Learn about this fascinating history from local guides descended from the very first pearlers. From here, you’ll soon reach Kooljaman at Cape Leveque, where you may like to swim on the Eastern beach, take one of the lovely walks over the Cape itself or alternatively you might choose to go for a wander along the Western beach where famous red sandstone cliffs tower above the white sand providing some of the most famous images of this area. Driving back to Broome through the afternoon, and the check into the lodge for the evening. 1 night camping with facilities. Includes breakfast lunch and dinner. Its an early start this morning, as you leave Broome when the sun begins to rise. While travelling through the remote Kimberley landscape, your guide shares stories of local history, people and the environment. Enjoy a morning tea break by the Fitzroy River and visit the Derby ‘Boab Prison Tree’, before hitting the Gibb River Road. From here, visit the fascinating Mowanjum Aboriginal Art & Cultural Centre for an insight into the culture of the Worrorra, Ngarinyin and Wunumbal tribes and their supreme spirit being, the Wandjina. The afternoon is devoted to exploring Tunnel Creek with your guide. In this 750-metre cave system carved through the Napier Range, discover stalactites, secret caves and a large variety of wildlife. It’s here whwre you’ll also learn the legend of Jandamarra, an Aboriginal freedom fighter who used the tunnel as a hide-out in the late 1800s. Dont miss a refreshing swim in an idyllic waterhole. Tonight, settle into your first night under the Kimberley night sky. Includes breakfast, lunch and dinner. 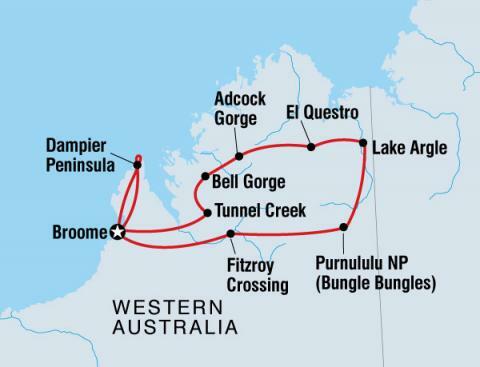 First thing this morning we head off for Bell Gorge, a hidden highlight of the West Kimberleys. This idyllic retreat, considered the most beautiful in the area, boasts cascading waterfalls and crystal clear pools formed over millions of years – an easy place to while away a few hours! We’ll then travel slowly along the Gibb River Road to Mt Barnett Cattle Station exploring the beautiful and ancient King Leopold Range on the way to our camp by the Manning River. Includes breakfast, lunch and dinner. Spend today swimming in paradise. Cross the Manning River and hike through the rugged wilderness of the King Leopold Ranges to arrive at the stunning Manning Gorge. Amid the rugged beauty of Manning Falls swim in the deep clear pool, discover Aboriginal rock art and look out for wildlife on the edges of the water. Return the way you came to spend a second night at the beautiful Mt Barnett Cattle Station camp. Includes breakfast, lunch and dinner. This morning leave Mt Barnett to drive the back end of the Gibb River Road. An absolutely magical drive out of the King Leopold Ranges and into the Pentecost Range. Stop at a stunning lookout over the high flat mesas of the Cockburn Range with the Pentecost River snaking its way past the mountains out to the sea. Drive down to the Pentecost River for an iconic photograph before driving across the river. Shortly after a river crossing you will arrive in the scenic El Questro Wilderness Park, where you will set up in our permanent camp for two nights. Includes breakfast, lunch and dinner. Today you will visit the spectacular Zebedee Springs, a natural hot spring that remains 28-32 degrees year round and is surrounded by towering Livistonia palms. After a soak in the springs, hike over the ancient boulders of Emma Gorge. 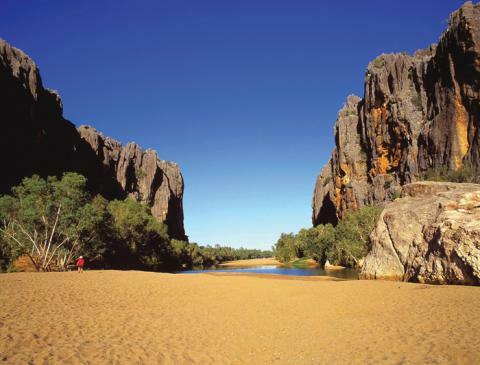 This short walk offers stunning views of the huge sandstone cliffs before cooling off at a very special waterhole. The afternoon is yours to do as you wish. Perhaps head to the station’s bar in the evening to enjoy a beer with the rest of the group. Breakfast and lunch included. We emerge from the Gibb River Road for a few hours free time in Kununurra. In the afternoon, travel onto the shores of the expansive Lake Argyle, the heart of the Ord River Irrigation System which has transformed this dry region into a lush agricultural oasis. There is free time to join a sunset boat cruise on the lake (approx AU$100pp), visit the historic Durack Homestead Museum or take on one of the many bush trails to explore the area. Breakfast included. After a leisurely morning, head south down the Great Northern Highway to Purnululu National Park, home of the magnificent Bungle Bungle Range. You will enjoy two nights here, staying overnight in the new private Bungle Bungle Safari Camp in the heart of the Park. 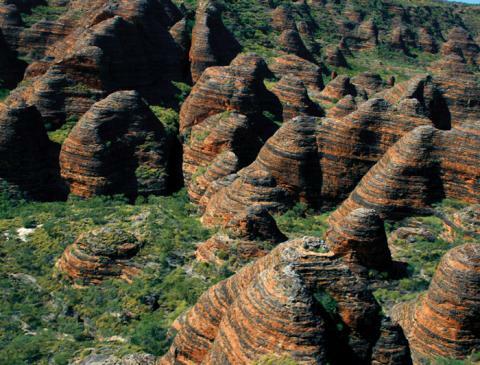 This is the only camp in the national park to overlook the Bungle Bungle Range. Two days here means you will have a full day to explore the highlights of this extraordinary national park, the most famous of which are the beehive domes. Breakfast, lunch and dinner included. A morning cruise through the majestic Geikie Gorge is a great start to your last day. Nature carved this wonder through the Napier Range during the Devonian geological period. Learn of the fascinating geology and discover the huge array of wildlife, including freshwater crocodiles, birds and fish. Explore Old Fitzroy Crossing and enjoy lunch by the river before returning to Broome. Includes breakfast and lunch. As the adventure draws to an end, it is time to bid farewell to the Kimberley. 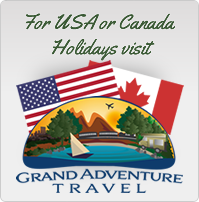 If you are departing on a flight today, an airport transfer is included. 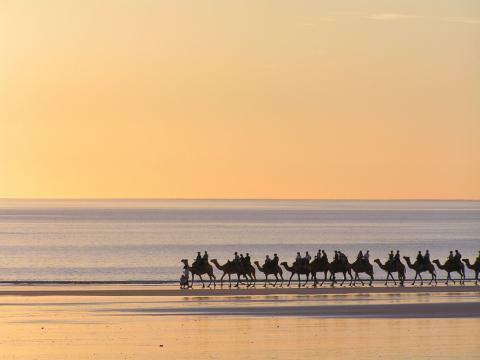 Alternatively, you may have booked into one of Broomes many resorts for a little luxury following your intrepid experience in the Kimberley wilderness, there is plenty more of Broome to explore and experience. Breakfast included.